Discover the secret recipes from youir favorite restaurants &easily cook them yourself! Click Here to order NOW and start cooking well over 700 amazing dishes for your family! ! I am a native Chinese and a former Beijinger. I have composed the following China eating out guide basing upon my very personal experiences of eating out in Beijing on regular basis for years. I wish this guide can provide an overview of the food services in China. I lived in Beijing for ten years before going abroad, five years studying in Chinghua University and the other five years working in an IT company. I was single at that time and had no facilities to cook by myself. So I ate out on a daily basis either in Chinghua University restaurants or outside of the campus. As follows I will review seven categories of Beijing restaurants one by one. What I discuss below apply to other Chinese big cities as well. Normally, you can identify the category of restaurants by its outlook and decoration level. The better the decoration is, the more expensive the dishes are. Another criterion to easily measure the level of restaurants is whether they provide white table cloth or not. If the restaurant provides white table-cloth, it belongs to mid-level or above in my categorization. Restaurant in Hotels of 4 Stars and above. In my opinion, restaurants in China's big hotels of Four-Star and above are just too dear. Their prices are made according to international expenditure level in foreign currency. When measuring in Chinese Yuan it is too expensive. The environment and food quality are fine, but the foods are not diversified. If you want to taste some featured food, you have to go outside of the hotel. The goodness of the restaurants in big hotels is that they normally provide English menus and the servants speak English. Most other types of restaurants do not provide English menu or have English-speaking servants unless those restaurants are located at areas where a lot of international guests live. It becomes more and more fashionable for top level restaurants to decorate in luxurious and ancient Chinese building style. Normally this kind of restaurants are very big, often have multiple floors. There is a phenomenon that the better the restaurant decoration is, the more packed it is during meal time because majority of the guests going to such restaurants are spending corporate money for meal. Chinese citizens, even those who earn good salary, would not go to such restaurants for meal. That is too dear. Guests from big companies and government do not mind the high price. Actually from their point of view, they just want to find the most luxurious place. High level restaurants' food quality, featuring, hygiene and service are all excellent. For foreigners the price of dishes there, when exchanged into foreign currency, is not too dear. Therefore, comparing with restaurants inside big hotels, such kind of restaurants is definitely of better value. Cheaper price and better food. Occasionally some high level restaurants do not price their dishes at very high price while still providing good food and service. If so, they must be always packed. These restaurants normally are targeting at corporate-funded Chinese guests. Mostly the servants do not speak English. So if you want to go to these restaurants, you must either speak Chinese reasonably well or go with your Chinese friends. Those restaurants that provide white table cloth but has smaller scale and less luxurious decoration belong to this category. Their food quality, featuring of food and service level is quite varied. Their price is acceptable for Chinese who earn good salary. The outstanding advantage of this kind of restaurants is the special featured food and uniformed quality of food and service. And it is not expensive. The mass salary-earning Chinese citizens like this kind of restaurants most. I highly suggest foreign friends try these restaurants. Personally, I liked to go to this kind of restaurants very much. There are such kind of restaurants specialized in selling many different kinds of food. When I was working in Beijing, down my workplace, there was a small restaurant selling tea, porridge, baked sesame seed coated dough pastry etc. It was very clean and had very good air-conditioning in summer. It was always packed at summer lunch time. When in hot days, this kind of simple food seemed being people¡¯s top choice. I also liked to go to a dumpling restaurant where you can have dumplings with different types of stuffing including several types of vegetarian stuffing. I also liked to go to specialized Beijing Duck restaurants. 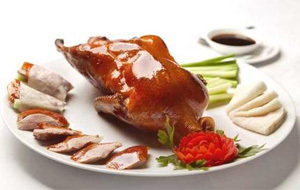 Standard Beijing Duck dish was served with small steamed pancakes, scallions and sweat soybean paste. Sliced duck meat is to be wrapped with a steamed pancake and eaten by hand. There was a tiny Korean restaurant down the street of my workplace. 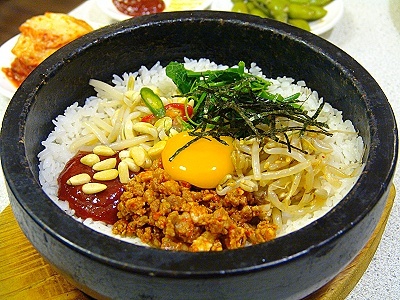 Its Korean Mixed Rice is my favorite food. 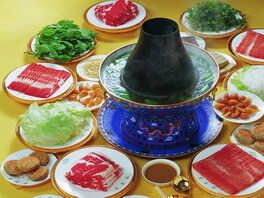 In winter, Instant-boiled Mutton ("Shuan-yang-rou" in Chinese)is very popular hot pot in north China. I like it as well. Most restaurants have Instant-boiled Mutton, but the quality is quite varied from each other. Cheap restaurants are where most urban Chinese people often go to. This kind of restaurants was where I had meal most often. Some cheap restaurants also have good featured dishes. 10 Chinese Yuan is enough for one person to have a full meal at such places. If exchanged into Euro, it is just ¢ã1! However, generally, the quality of food and hygiene of this kind of restaurants is not guaranteed. You have to try them before you know which restaurant's food quality and hygiene is acceptable, which restaurant is good at what dish, which restaurant has friendly servant. When working in Beijing, I ate through all the cheap restaurants down the street of my workplace. In one of the cheap restaurants, they served excellent ¡°Noodle with Fried Soybean Sauce¡±. I went there from time to time to enjoy the noodle. 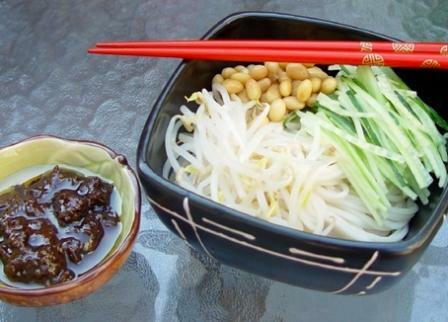 ¡°Noodle with Fried Soybean Sauce¡± is the only "Ming's Special Recommendation" in this whole "China Eating out Guide". For foreigners, the cheap price may not be main criterion for you to choose this kind of restaurants. The food served in this kind of small restaurants can be found in better restaurants as well. However, if you speak reasonably good Chinese and just want to experience ordinary Chinese people¡¯s life, you can go to these cheap restaurants. If your Chinese friends know some good cheap restaurants, you can go with them as well. Nowadays, in China's big cities, it is popular for big shopping malls to have food court at the top floor. Some shopping malls' food courts are excellent for its extremely diversified food. What are served at such food court are not dishes but small eatings like fries, dumplings, porridge etc. And they just cooked the food in front of you for you to see. The hygiene and quality of food was acceptable. This kind of food courts is where urban Chinese people like to go. At meal time, it is often over-packed. The price is not expensive. I seldom went to such places when I was in Beijing, because it was too crowded and I did not like to spend time in queuing. In China's cities, many breakfast providers just set up temporary food stands beside roads in the morning. I often had breakfast at such places on my way cycling to work. What I ate at the on-street food stands was the typical breakfast food in north China - Youtiao (Deep Fried Strip of Dough). It was normally served with Rice Porridge, or Soy Milk or Hundun (Wonton in Cantonese, a type of dumpling served in soup). 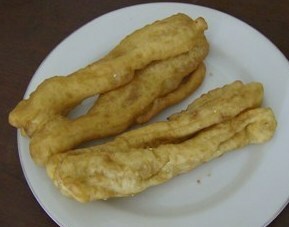 Youtiao (Deep fried strip of Dough). 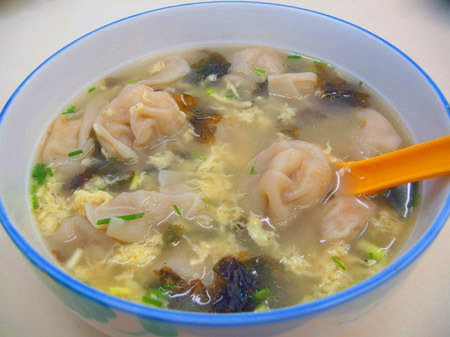 Hundun (a type of dumpling served in soup). In the above review, I categorized the restaurants according to price level. Actually the real way of categorizing Chinese restaurants is by region. You will often see many restaurants' names including a province name, say ¡°¡­Restaurant of Chuan Dishes¡± (Sichuan province cuisine), ¡°¡­Restaurant of Yue Dishes¡± (Guangdong province cuisine), ¡°¡­ Restaurant of Lu Dishes¡± (Shandong province cuisine) etc. China is a country having big land and many different tribes. Along the history, different provinces have developed their own unique regional featured cuisine. Different regional cuisines have their own special features in terms of raw food material, cooking method, seasoning etc, and have their unique renowned series of dishes. Normally people say there are Eight Major Regional Cuisines. They are all called Chinese dishes. If I spell out all of them here, it won't make sense to you when you have never tasted them. What you need to know is that restaurants of different provincial cuisines have their unique dishes in their menus. 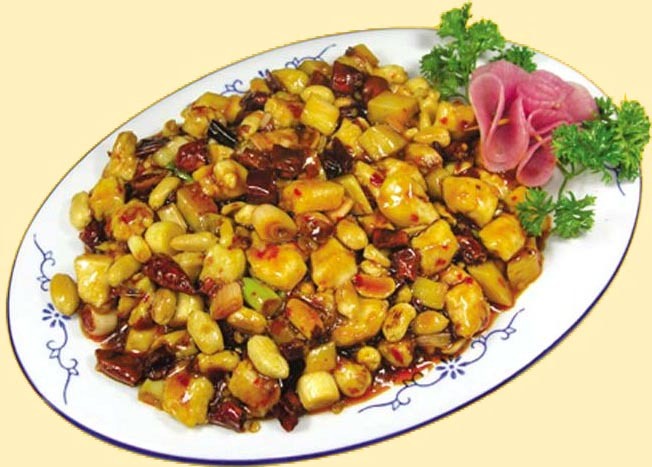 For example, Kung Pao Chicken is a classical dish of Sichuan Cuisine. My suggestion is, eat through the restaurants of different regional cuisines, and you will know them. To end this China Eating Out Guide, I have a final advice to share. This is an advice that won't apply to those who only eat out occasionally. However, if you are a regular outside eater, you will find this advice very valuable. That is: TAKE IT LIGHTLY. Chinese food culture indeed has a huge amount of contents. Even if you try one different type of food per day, it may take you months to finish trying all the food. However, you cannot be too excited, otherwise you will be disappointed soon. There are several reasons for this. All senses of humans tend to become blunt and dull if one senses too much of something. However delicious the food is, if you have it for every meal, you may feel sick of it at the end. Nowadays, due to the competition between restaurants, in order to stand out of the crowd in competition, restaurants are applying stronger and stronger seasonings while cooking. In a long run, this will cause a negative effect that people¡¯s general sense of taste becomes blunt and will feel dishes with regular seasoning are too plain. At the end, people will feel that no food are good to eat and become sick of having meals. The main stream Chinese traditional culture, including the food culture, has been totally ruined during the Cultural Revolution in Mao's period. What current people know about Chinese food culture is a little and superficial part of traditional Chinese food culture and has lost the essence. The current wide-spreading way of relying on seasoning to make dishes tasty is very typical manifestation of this loss.Click here for more on ancient Chinese food culture. Along with the non-healthy economic development in recent years, China's environment has been destroyed seriously. At the very biginning, raw food materials are already not as good as before any more. Due to the above reasons, if you desire too much from these Chinese restaurants, you will be disappointed. It will harm your health if your taste becomes critical. So take it lightly. Living a simple life is always the correct way. Want to Eat a Healthy and Balanced Diet? Chinese Food IS the Solution! Recipes with 173 Colorful Pictures! Go to page "Best Chinese Food"
Go to Home page of "Foreingers in China"